Microsoft's campaign is underway across the board with Windows 8, RT and WP 8 and all eyes are now set on Redmond's allies for a demonstration of fire power. Following some early warning shots from Nokia and HTC, Samsung are now free to fire at will. Their Ativ S was the first Windows Phone 8 flagship announced and, respectful of chronology, the first we're about to properly review. 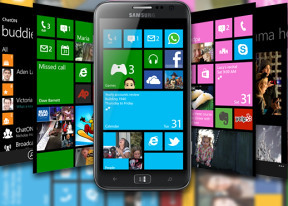 The Nokia Lumia 920, the HTC Windows Phone 8X and the Ativ S are often painted as allies - but that's mostly rhetoric. To a certain point, they have little choice but to unite against the Android and iPhone hordes. On the other hand, these fine smartphones will be sworn enemies fighting over every user drawn close enough by Microsoft's upgraded platform. And by the way, Windows Phone 8's appeal is easy enough to understand. It is now a consistent cross-device platform that will get app developers interested. Multiple-core-chipset and screen resolution support will help Microsoft-powered devices stand next to their Android and iOS counterparts as equals. OEMs on the other hand are also giving potential users a good enough reason to be excited. Just look at what the Ativ S is offering to those who are willing to go with Samsung. So, there we are. The Ativ S is running an OS that has just had its potential unlocked by a major update. The hardware powering has been inspired by no other but Samsung's droid flagship, the Galaxy S III. OK, it's a different chipset, and a couple of CPU cores short, but most of the rest is there - from the HD Super AMOLED screen to the 8MP camera. Windows Phone 8 has finally caught up with the industry leaders. There's a massive gap between Samsung's last generation of Windows Phone and the Ativ S. Goodbye, Omnia and, sorry to say, you won't be badly missed. They could've done better when naming the new lineup, that's for sure. But the fresh start most certainly called for a brand new name. That's a minor point though - we can live with a name without a ring as long as the engine's got a hearty rumble. So, we're taking the Samsung Ativ S out for a spin and you're most welcome to join. Hit the jump to the design and build.